If you are an Admin for TSheets and if you have Admin rights for Karbon, click on Settings from the main menu and choose Connected apps. If you have already connected to TSheets, you'll then be able to select this to adjust your settings. You can choose to track time against each contact, or both contacts and work items. 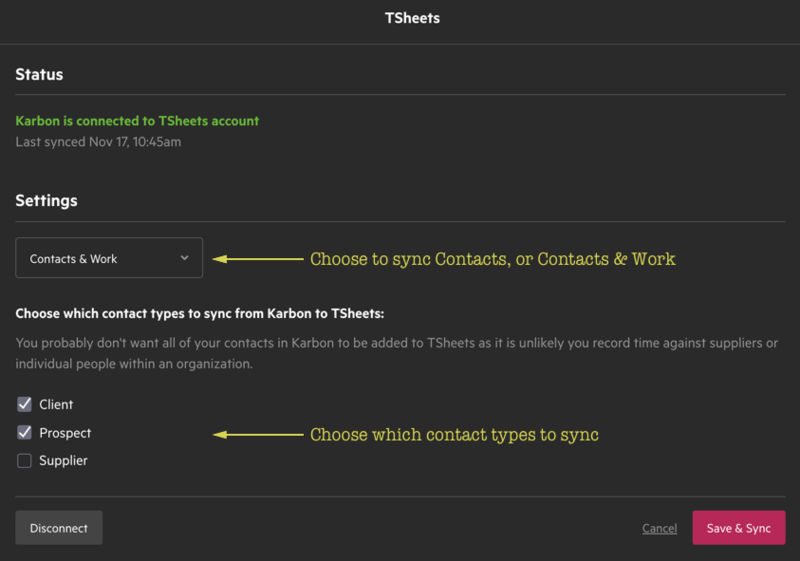 Note: Choosing to sync your work will create codes in TSheets for all of your Karbon work items. So, if you will only be tracking time against clients, keep things clean by only selecting to sync your contacts. You then select what contact types you will track time against. For example, if you don't need to track time against Suppliers, you can leave that contact type unchecked. Once you click Save & Sync.